Welcome to the Dolphin Eco Tour! On July 19, it was a sunny and beautiful Thursday morning at Bluewater Resort in Hilton Head Island, South Carolina. 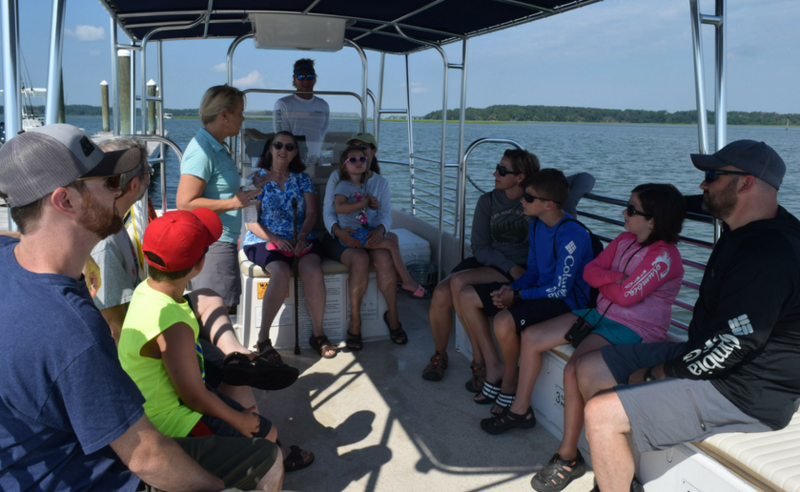 The Dolphin Eco Tour began at 10:30 a.m. at the Bluewater Dockside Pavilion and the excursion was a two-hour Intracoastal Waterway trip. Our group consisted of 12 people (adults and children) who were all eager to spot dolphins up close. Our tour guides, Marci-Anne Leysen, Director of Activities & Recreation for Spinnaker Resorts and Joe, the Captain, shared their knowledge of the dolphins as we cruised the relatively calm Intracoastal waters. Throughout the tour the group took pictures, asked questions and got an understanding of the dolphins in their natural habitat. The best part, we observed dolphins in action! It was as if they knew we were there to watch them. These adorable creatures demonstrate intelligence. They tend to travel in groups that can range from few to many. Others just like to travel alone within the area. You just want to swim with them! Captain Joe has strong knowledge of the Intracoastal Waterway and he knew where to go to have the best opportunity to see these awesome creatures. More than once, Captain Joe spotted a dolphin and shut off the engine of the boat because dolphins seem to be more receptive to show themselves when it’s quiet. The dolphins were swimming in a group, in a pair and individually. Two of them jumped out of the water to show off for us. They seemed playful and to almost welcome us into their waterworld. We were excited as well as surprised because we could even hear the sounds of their breathing which was incredible! You can sign up for this wonderful excursion at the Bluewater Resort Cabana or the Waterside Recreation Room. We hope to see you on your next visit to Hilton Head Island and at The Dolphin Eco Tour at Bluewater.